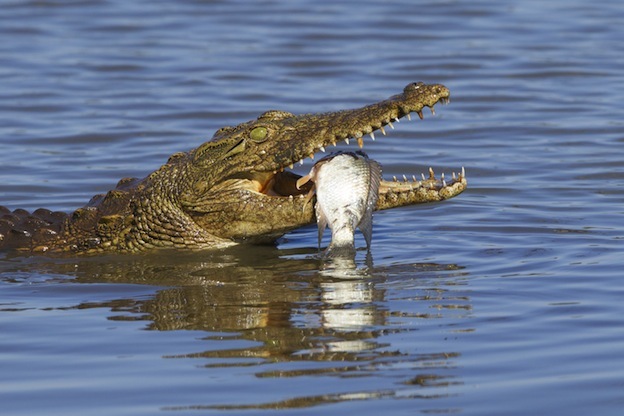 Crocodiles feed on a variety of different types of foods out there. They are opportunistic so they will take what they can find. Many people assume they are slow moving animals but that isn’t so. While they usually do move at a slow pace they also use that to their advantage around prey. They will wait until the perfect moment to attack in a very fast precession. Most of their food source consists of different types of vertebrates including fish. They will feed on different types of mammals that come to their water resources to drink or to cross to the land on the other side. 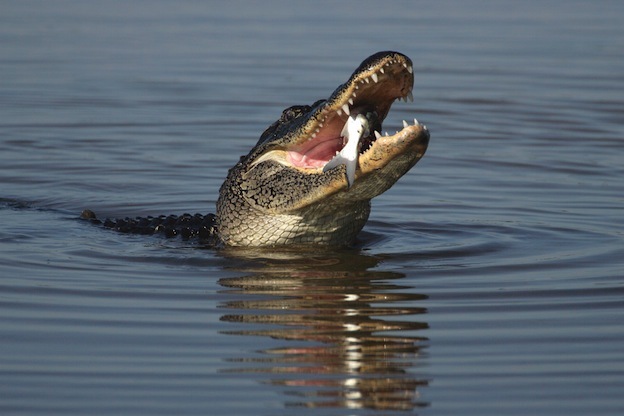 When they are hungry and other reptiles are around they aren’t will consume them as well. Some of them will also eat mollusks and crustaceans if they are having a hard time finding enough other sources of food out there. Meals can be very far between for this animal. However, they have a very slow metabolism which means they can go for several months without any food (as long as two years for some big adults!). They are going to eat whatever they can though – even animals much larger than them. The fact that crocodiles move much faster in the water than on land is why they often hunt there. They can hide in just a foot or so of water or mud. They wait patiently and as other animals come into the area to feed they can attack in a moments notice. They can take control of larger animals that way and then push their face under the water so they drown. The “Death roll” is a technique used to kill their prey. Animals that are on land often are able to get away. This is why many animals will keep their body on the land and drink as quickly as they can. However, there are times when they do need to cross the water or they are going to go into it so they can cool down their bodies. The fact that the crocodile can go for about a week without a meal means he doesn’t have to hunt as frequently as other animals. Still, of a meal comes along daily or several times a day and they will take advantage of it. During certain times of the year they can eat heavily. Others though they will find just enough food to get by. The methods of hunting by the crocodile are very interesting. Sometimes they will wait in ambush for hours before something to eat comes along. Other times they will have a remarkable opportunity that appears out of nowhere. Yet there are other times when a crocodile will sit quietly and allow some type of food source to pass it by. Perhaps it isn’t hungry or there is some other motivation behind it? This is an issue that continues to fascinate researchers. It is something that can be risky though. We do know that crocodiles will intentionally consume large rocks. This is to help balance out the needs of their digestive system. It will help to crush the foods that they have swallowed so it can be used by the body for nutrients.